A private, nonprofit oceanographic research institution that studies and conducts exploration of the ocean. The customer purchased a set of 5/16” round swaging dies to produce cable assemblies from an industry manufacturer. They were dissatisfied with the finish of the swaged fittings. Unsure how to proceed, they approached Assembly Specialty for help. Assembly Specialty determined that the dies were not perfectly squared before machining, which adversely affected the alignment of the two die halves. In addition, the cavity was machined slightly undersize and lacked proper relief for material flow. The steel fitting got pinched during swaging, creating flashing at 180 degrees on either side. When the fitting was turned to complete the rounding of the swaged shank it rolled the flashing over into the wall of the fitting. The result was a poor appearance on the wire rope fitting and excess material being left in the die after swaging, causing premature wear. We squared the die blocks and properly machined the cavity, correcting the diameter to the specified size and relieving the sides of the cavity to eliminate the pinching and flashing that ruined the stud’s finished appearance. 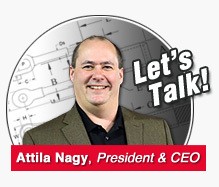 Attila Nagy, president and chief engineer, Assembly Specialty Products, Inc.
Are you looking for a solution to an engineering challenge? Do you have an engineering challenge you're unsure how to solve?